The Lea Hough building surveying team has specialists who deal with Party Wall matters. The Party Wall Etc. Act stipulates that certain construction works require a Notice to be prepared and served on the owner of the adjoining property. 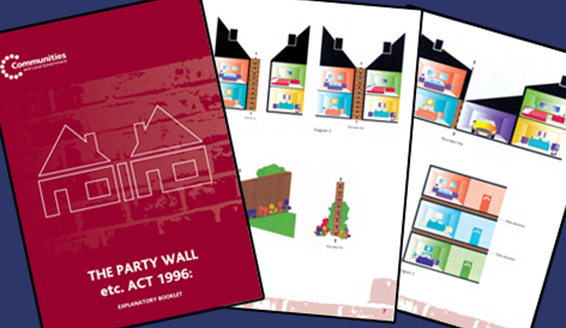 Typically these works include: undertaking works to an existing party wall or structure shared with another property; extending or raising a party wall; building an extension and excavating near to neighbouring property; building a new wall up to or astride the boundary with a neighbouring property; building a wall on the party line where the foundations may spread into the adjoining owner’s property; installing piled foundations or special foundations in close proximity to a neighbour’s building; etc. Lea Hough team can handle all your Party Wall matters, from providing initial advice on whether the Act will be applicable to your proposed project, through to serving relevant Notices, preparing a Party Wall Award and a Schedule of Condition before works commence and undertaking inspections upon completion. We can act as Building Owner’s Surveyor, Adjoining Owner’s Surveyor, or impartial Agreed Surveyor representing both parties. We act for a number of commercial clients with large property portfolios, and developers, as well as individual property owners across Lancashire and the north-west.